Arthritis in cats is now becoming much more common than we once thought – perhaps because we are now more aware about cats, their gaits and lifestyles. In fact, this is often an owner-recognised diagnosis by people who are clever enough to realise that something has changed about their cats and the way that they now go about their lives. The causes in cats seem to be different than they are in dogs. Some cases may be due to old age wear and tear but for many cats the cause is mysterious and is often occurring at an early age. Symptoms in these younger cats are not immediately obvious however, but do worsen over time. 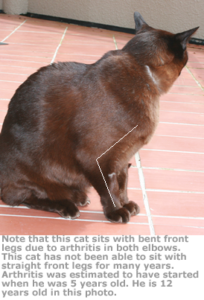 Arthritic bone lesions are sometimes seen in these cats at an early age but the cat does not appear to be showing any symptoms. By the time it is noticed the osteoarthritis is well established and the lesions are embellished on xray. For the majority of these cats the precise cause of their arthritis is just not known. – not inclined to jump any more; they circle and hesitate and then do the preliminaries all over again before finally jumping. In the past they would have leapt without hesitation. – if they do jump then they occasionally either miss their target or they fall. -some cats now climb up onto the bed or couch whereas before they simply bounded up in a simple graceful leap. Despite all these symptoms, cats often give the impression that there is nothing wrong; they still seem to go up and down stairs; they are seen over at the neighbours and they are engaging in activities that they always did. It is just that they are now probably not doing them as often as they used to and even if people notice this , they put it down to “just the cat getting old”. And the symptoms described above are not fully comprehended by their owners because of their variability and subtlety. Make no mistake however that these cats are sore and these subtle changes are due to osteoarthritic pain. It is also not possible for vets to pick up many of these symptoms when examining cats in the vet clinic and we rely heavily on owners observing some of these changes in the home environment. For these reasons, we often get owners to answer questions concerning their activity based on some of the symptoms described above. Of course some joints are sore when examined by vets. 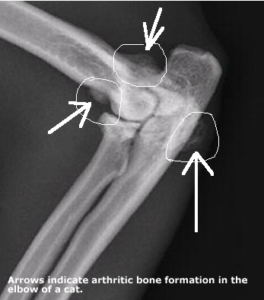 These joints often show arthritis on xray. WEIGHT LOSS -if this is a contributing factor. Weight loss is not always easy to achieve in the cat but obesity can contribute significantly to arthritis symptoms. ANTI-INFLAMMATORY MEDICATIONS to eliminate pain. The responses to these treatments are often amazing and frequently bring about a transformation in these cats. Commonly it comes as a liquid that is mixed into their food and it bestows immediate pain relief. Cats start grooming properly again, resume their old activity levels and return to jumping up to their old favourite haunts. GLUCOSAMINES coupled with Omega3. These substances are well known to reduce the symptoms of arthritis. Fortunately they are available as prescription diets that cats can eat straight from the packet. These products are known to reduce the rate at which arthritis progresses and coupled with their anti-inflammatory properties, make arthritic cats far more comfortable. They have high levels of antioxidants and L-carnitine to promote weight loss and the essential fatty acids promote joint cartilage nourishment. 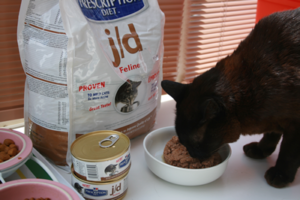 We will often start cats on this diet in conjunction with a course of glucosamine injections. They then go onto a combination of prescription diets and pain medications. The frequency of giving these pain medications reduces over time in general, and cats need to be monitored whilst they are on them. The glucosamine diets however continue indefinitely and the occasional glucosamine injection can be given when required as a booster.